Jack & Rose before the sinking! I wanted to do something fitting for my boyfriend & I for our first Halloween together. When we first started dating, we definitely bonded over Titanic, it was one of the first movies we watched together. I felt it was appropriate to shoot for Jack & Rose, but I knew it would be difficult. I'm a stickler for details, I always try and get my costumes to look at authentic as possible. Of course Ron's costume was easier, I found his shirt on H&M, & the suspenders & pants on eBay. I did also put tack buttons on his pants to hold the suspenders (again, all about authenticity!) He wore his own shoes, and I taped a print out of Rose's drawing to a resume portfolio I had. My costume, I knew I'd have to do in parts. 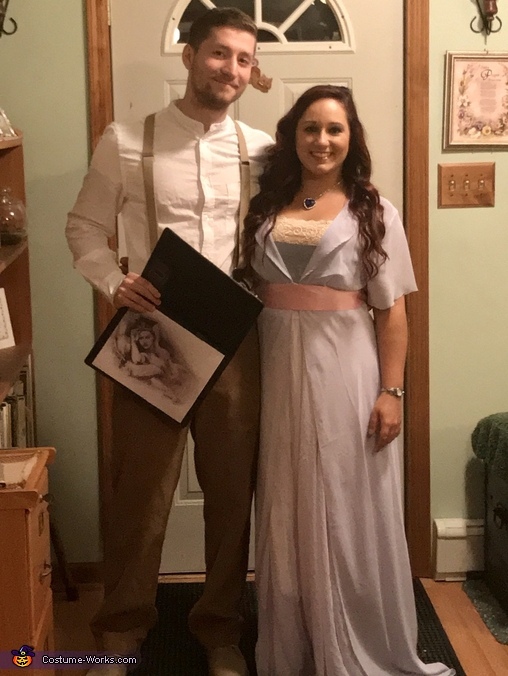 I got a chiffon skirt from Etsy, a negligee robe from eBay which I cut the sleeves from, a beige lace top cami which I taped blue ribbon to in the appropriate spot, and finished it up by wrapping a pink ribbon sash around my waist. Of course I was able to find a pretty inexpensive Heart of the Ocean replica on eBay as well, that's pretty much the only way anyone knew who I was at my Halloween party. Hey, Titanic is 20 years old already! Still, I'm pretty proud of what I was able to put together & I think we nailed it!